The drive from Willis to San Antonio took longer than expected. We intentionally took a back roads route rather than have to contend with the Houston beltway. However, as soon as we reached Interstate 10, we ran into a massive traffic jam. We sat in bumper-to-bumper traffic for nearly an hour until we passed the point where the interstate narrowed down to one lane. This was not good for our fuel consumption and the Ram ended up consuming 28 gallons of diesel just to cover the 245 mile trip. As usual, we were quite tired at the end of the drive and were very glad to find that our site was easy to pull into and set up. We had selected the Travelers World RV Park due to its proximity to downtown San Antonio. Rather than having to pay the high cost of parking lots near the downtown attraction, we were able to catch a bus right across the street from the RV park. We bought all-day passes for $4 each on December 31st and headed downtown in the morning to do our initial exploring. The temperature was in the low 50s but the wind made it feel colder. Our first stop was at the Alamo. Although there was a long line to enter the Shrine, the line moved quickly and we were glad we had waited. As we had read previously, the Alamo is not very big but they did have a number of very interesting displays, including one of Davy Crockett’s rifles. After the Alamo, we went to the Riverwalk to find a place to have lunch. The place was quite busy. In addition to being New Year’s Eve day, the Alamo bowl was scheduled for January 2nd and there were lots of Oregon and TCU fans on the Riverwalk. We strolled for a while checking out our options and finally decided on a barbeque restaurant where we had lunch outdoors right by the river. After lunch we strolled the Riverwalk some more before returning to the RV park. That evening we hopped back on the bus and headed back downtown. We headed to Howl at the Moon, a highly-recommended piano bar. We got there about 7:45 pm and, although the line was fairly short, they were asking for people with reservations. We had not anticipated the need for reservations for so early in the evening but, in hindsight, that was a big mistake. We were charged a non-refundable cover charge but were not told that it was standing room only. Needless to say, we were not happy campers when we ended up having to stand with our coats in our hands. We watched the show for about 1 ½ hours before deciding to go find someplace to eat. That also turned out to be a challenge as every restaurant either had long lines or had stopped taking names. We finally got into Joe’s Crab Shack around 10:30 pm and, after dinner, beat the rush by catching the 11:30 pm bus back to the park. We got to see lots of fireworks all around us as we walked back to our rig and watched the ball drop in San Antonio on TV. The next two days were quite rainy. We spent all of New Year’s Day at home, mostly watching bowl games. We were glad to see the Vols win their game in a rout. On Saturday, we ventured out and saw more of the city by car. Our GPS had a mind of its own and we ended up making numerous wrong turns. We shopped at Lowes and a local produce market before heading to the North Star Mall. The mall was packed and looked like pre-Christmas shopping season, probably due to the lousy weather. 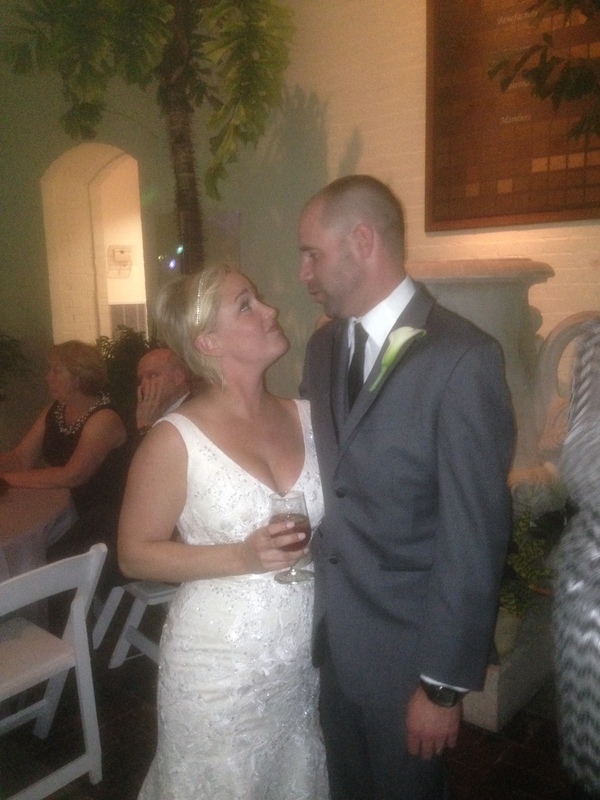 On Sunday, it was time to move on. We were both glad the drive to Kerrville was a short one, however not as short as our GPS indicated. We’ve discovered that the GPS and online maps base all their times on highway speeds which are frequently 75 mph in Texas. We don’t drive faster than 65 mph. The GPS also seems to ignore the time spent at traffic lights which was significant. Anyway, we were glad to only have a 65 mile trip and we arrived in Kerrville around 1 pm. We got a sense for why Kerrville is considered part of the Texas “hit country” when the truck struggled somewhat to get the 19,000 lb. fifth wheel up the steep grades. Although our time in San Antonio was short, we will only be about an hour away during our month in Kerrville so we might be back. 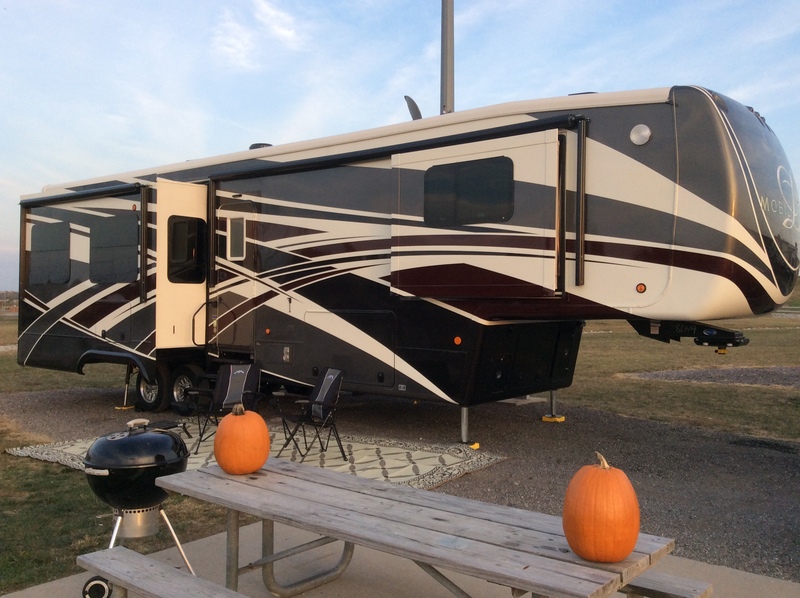 One of the freebies we got when we purchased our rig from RV’s for Less was a one year membership in Thousand Trails, owners of a lot of campgrounds throughout the United States. We had to select one region for the year and we selected the southeastern United States region, which includes Texas. We can stay at Thousand Trails campgrounds for free ($3 per day for 50 amp service), for up to 14 days at a time. After 14 days we would have to leave for at least 7 days before returning to the same campground. 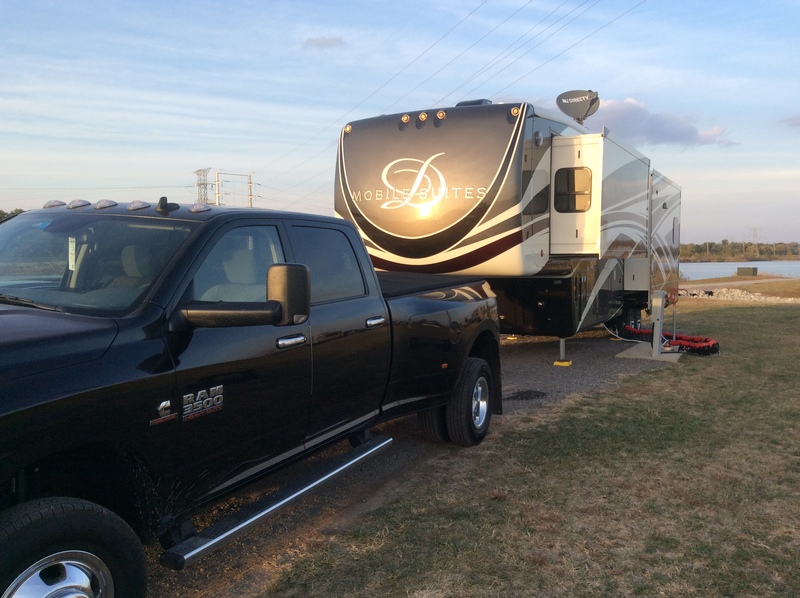 Although the reviews of the various Thousand Trails campgrounds are mostly so-so, there is a Thousand Trails campground at Lake Conroe in Willis, TX that is generally believed to be the best of the Thousand Trails facilities in TX. It’s only about an hour’s drive from Livingston. We decided to give it a try for 14 days over Christmas. Since we were going to head to Tennessee for Christmas, we really only planned to be at Lake Conroe for seven of the days. Although this didn’t allow us time to fully explore the campground, we found it to be a pretty nice place (definitely worth the $3 per night we paid) and one we will likely visit again during our one-year membership. The roads and the campsites were rather rutted and the sites were not as level as we would hope. The layout of the campsites allowed for two rigs to be parked rather close together but fortunately no one moved in next to us. We spent much of the first five days getting ready for Christmas. We drove to Montgomery, TX for Jan to get her hair done while Phil used the local library’s free Wi-Fi, then did some last minute Christmas shopping. We left Willis on December 21st to head north. For reasons we still don’t understand our Rand McNally GPS took us the long way though Louisiana and Mississippi. We dealt with rain (occasionally torrential) most of the first day but made it as far as Jackson, TN. We traveled to Nashville on the 22nd to get our bicycles that we had left with Jason and to celebrate Christmas with Lizzi and Jess before they left town for Christmas. We had reserved a cabin at Nathan Bedford Forrest State Park in Eva, TN for December 23-27. This was our 12th consecutive Christmas stay in a cabin at the park. We had the cabin to ourselves on the 23rd and had catfish for dinner at Country and Western. Jan had hoped to host a get-together with the girlfriends but a severe storm and tornado warning ended those plans. Jason and Jarrod arrived on the 24th. The weather was unbelievably warm with a high of 71 degrees. After dinner we played numerous competitive games of Marbles. After opening presents in the morning of Christmas Day, we hosted the Christmas dinner with 10 family members. During dinner we played a game in which each person had to assume the identity of another person (either real or fictitious) and the others had to guess who it was. Caleb won the award for identifying the most role players, although he also had the least identified role as Foghorn Leghorn. Jason won the award for the most outstanding role play as Muhammed Ali. 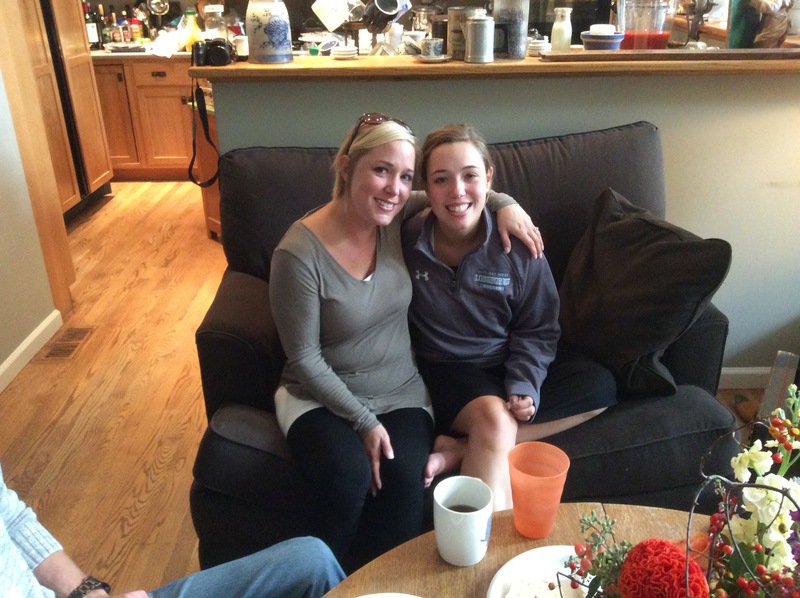 On December 26th, we hosted the annual Madden family reunion with 20 attendees and lots of great food. We played the Measles game in which each person was assigned a name other than their own and players were required to wear measles (stick-on stars) on their faces if they called an attendee by their real name rather than the assumed name. Cody, Liz and Claire Patton stopped by that evening for some more competitive Marbles games. After breakfast with Jason and Jarrod at the Downhome family restaurant on December 27th, we headed back to Texas. It was a great Christmas season, although we missed seeing Alison and Bill this year. We dealt with rain most of the drive on the 27th but it got seriously bad as we got close to Texarkana, TX. We had stopped at a rest stop on I-30 at about 4 pm and wondered why so many people were there. After driving on a few miles farther, our phones started going wild and we were notified twice for tornado warnings with “take cover” alerts and then flash flood warnings. We stopped for dinner to wait out the storm. Unfortunately the storm started up again with a fury after we got back on the road. As we approached Texarkana, the rain was coming down hard and the wind was intense. Phil struggled to see the lane markers and keep the car on the road, so we started looking for a hotel room. We finally called it a day and checked into the Wyndham Gardens in Texarkana about 6pm. We were glad we stopped, especially after seeing the news of 11 fatalities in north Texas from the storm (most of the fatalities had been in their cars). We finished the drive back to Willis on the 28th. Although the weather was rainy and windy, it was nowhere near as bad as the day before. We were glad to get back to our campsite and find that everything was still there. We spent two more days at Lake Conroe but most of our time was spent preparing for our trip to San Antonio. On December 2nd we arrived at Rainbow’s End, the flagship campground for Escapees, an organization that supports the needs of fulltime and part-time RVers. We had a nice long pull-through site and had no trouble getting set up. Our primary reason for coming to Livingston was to get established as Texas residents. The first step was to register our vehicles. Since we hadn’t paid any sales tax when we purchased the fifth wheel in TN, we had to write a big check to TX. The only big surprise with registering our vehicles came when the clerk at the county office noticed that the truck’s VIN number on the IL registration didn’t match the VIN number on the inspection certificate we had gotten in Texarkana. It turned out that Phil had used the wrong vehicle’s VIN number when he applied for insurance on the RAM and the vehicle inspector in Texarkana had copied this incorrect VIN number onto his inspection report. This necessitated calling the insurance company and correcting the VIN number, then getting the truck re-inspected, then returning to the county tax office to get the truck registered. But, by the end of day one, we had all three vehicles registered. The following day we attempted to get our drivers licenses. We had to make two trips since we had neglected to bring our passports with us the first time. Fortunately the lines weren’t too long and the Department of Public Safety employees were unusually friendly and helpful. Since the truck and fifth wheel have a combined gross weight of over 26,000 lbs., Phil needs a Class A classification on his driver’s license and that requires both written and road tests. Although Phil was able to pass the written test, he wasn’t able to get his license since the next available road test for a Class A license wasn’t until January 22nd and we would be gone from Livingston by then. The Rainbow’s End campground had a full slate of activities scheduled. We attended movies at the Clubhouse on Wednesday and Friday nights and a social hour on Sunday evening with cake and ice cream. Livingston is a fairly small town with a population of just over 5,000. While it does have a Super Walmart and a Lowes, it doesn’t have much of a business district. Phil called the insurance company to file a claim for the broken windshield in Jan’s car and the claims person set him up with a “local” glass company to do the repair. After Phil called to schedule the repair, he figured out that the glass shop was in Conroe, TX, an hour away. Fortunately, being semi-retired means that we have lots of free time and we killed nearly a full day with our trip to Conroe (with a couple of stops in Cleveland, TX in route). In addition to getting the windshield replaced (where the repairman was running 2 hours behind schedule), we had some great barbeque for lunch and had time to hit Walgreens, Sam’s Club and Lowes. We stopped at the TxDPS offices in Cleveland and Conroe to ask about scheduling Phil’s Class A road test but had no success. One day we made a trip to Lake Livingston State Park. We walked along the shoreline and spotted a number of turtles and water moccasins enjoying the sunny day. Since we hadn’t brought a picnic lunch, we visited the camp store and loaded up on junk food which we enjoyed at one of the picnic tables. We were visited by a somewhat aggressive squirrel who was obviously used to receiving handouts. After lunch we went for a 1-mile hike through the piney woods and saw a number of birds and butterflies but fortunately no more snakes. On our final day at Rainbow’s End we utilized the SmartWeigh facility to get our rig weighed. Unlike regular truck scales, we were able to get the weight loads on each wheel, both with and without the trailer hitched. Other than the need to rebalance our load a little bit, we did pretty well. However we did find that the trailer was somewhat overloaded and we will need to address this before we travel again. Some of the load can be moved into the car and truck but we will also need to reassess some of the things we brought with us and determine if we really need them. The trip from Poplar Bluff, MO to Livingston, TX covered over 560 miles and included stops in Little Rock, AR and Texarkana, TX. We’ve committed to limiting our daily drive to a maximum of 250 miles. Even with that, we were pretty well worn out at the each day of driving. 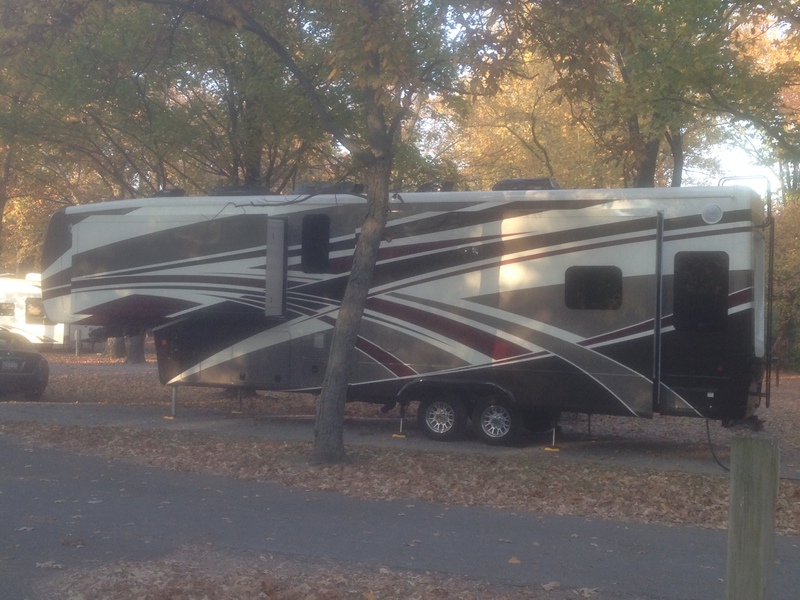 We spent two nights at the Downtown Riverside RV Park in North Little Rock which sits on the banks of the Arkansas River. We had previously enrolled in Passport America which provides for discounted campground fees. The Downtown Riverside RV Park provided our first opportunity to take advantage of the discounts. Unfortunately the discounts were limited to blind side back-in sites, which we were able to get for $11 per night rather than the $26 per night for the pull-through sites. On first glance, backing into our site didn’t appear that difficult since the sites was quite wide. However, it took several attempts and the assistance of a neighboring camper to get the job done. Although we parked as close to the water source as possible, our 25’ drinking water hose was not long enough to connect. Fortunately Phil was able to get a longer hose at the Wal-Mart a few miles away. Monday was Jan’s birthday. Although we had hoped to do a lot of walking on the riverfront trail, we awoke to a steady drizzle. The rain finally stopped around 11 am but the weather remained cold and damp all day. Plan B involved mostly indoor activities. Our first stop was the Little Rock Central High School, a historical site that is now managed by the National Park Service but which is still an active high school. In September 1957, nine black high school students (referred to as the Little Rock Nine) became the first blacks to attend the previously all-white high school. The governor of Arkansas called out the National Guard to keep them out. President Eisenhower intervened and sent in the 101st Airborne Division of the U.S. Army (without it’s black soldiers) who stood with bayonets drawn against the angry white mob. Eisenhower also federalized the entire Arkansas National Guard. The black students, although accompanied by soldiers in the hallways, were subjected to verbal and physical attacks throughout the year. The governor of Arkansas closed the Little Rock high schools the following year (referred to as the “Lost Year”) to block further segregation. The museum had a very good collection of film footage from the events as they occurred as well as recorded interviews with many of the participants looking back at what they went through. It did an excellent job of capturing the racism that was prevalent at the time and power of a mob mentality to intimidate those who wanted to do the right thing. Although racism still exists in America, this visit helped to point out how far we’ve come in our lifetimes. Our next stop was the William J. Clinton Presidential Library. The library sits next to a pedestrian bridge that crosses the Arkansas River and connects to our campground. The library, although unflatteringly referred to by some as looking like a double-wide trailer, had some nice exhibits. There was a replica of the Oval Office and Jan and Phil took turns sitting behind the President’s desk. Since we had skipped lunch, we went to an early dinner at the Flying Fish restaurant in the River Market district. We both had catfish fillets that were outstanding. Then we headed to Cracker Barrel so Jan could have a slice of birthday cake. The next day we drove to Texarkana, TX. This was our shortest drive and most of the drive was on interstate I-30. We arrived at the Shady Pines RV Park around 1 pm. The park, although lacking in frills, was perfect for our overnight needs The site was a pull-through and was flat and paved. The RV park was next door to the Shady Pines RV center so we were able to get our fifth wheel inspected. 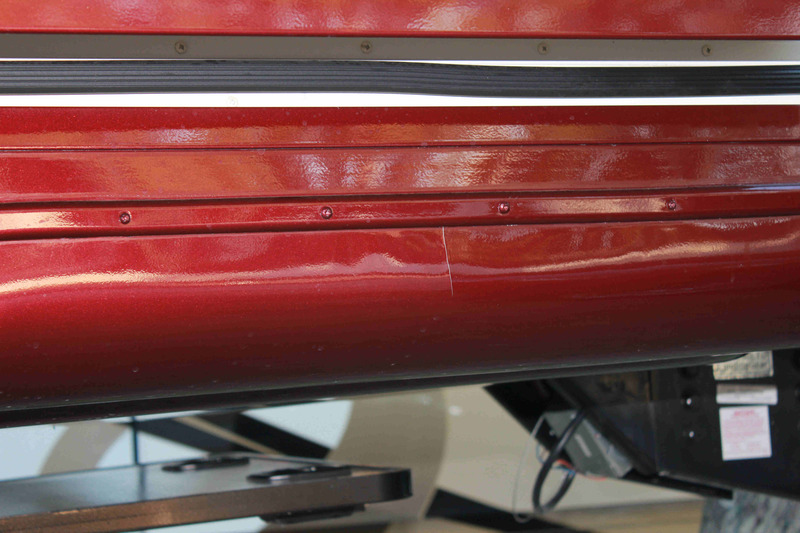 All vehicles, including the fifth wheel, must be inspected annually as part of the Texas registration process. While Jan caught up on the laundry, Phil took the car and the truck up the road to be inspected. On Wednesday we made the drive to Livingston, TX. This was our longest day of driving, mostly on state roads. Including a couple of stops along the way, it took us about 5 ½ hours to reach our destination. The drive was largely uneventful. However, Phil turned too soon in response to an instruction from the GPS and ended up driving the rig down a small back road. Fortunately the GPS found a way back to our route that did not involve backing up. We were glad to be finished driving and to be in one place for two weeks. The drive to Poplar Bluff provided somewhat of an education in the use of our new Rand McNally GPS. Although it probably did take us on the shortest route, it was definitely not the easiest drive. We ended up taking a back country road with ditches on either side. The road was quite curvy and, with the high winds buffeting the fifth wheel, the ditches sure looked a little too close for comfort. In the future, we will do a little more planning and will override the Rand McNally when their routing doesn’t make sense. We arrived at the Camelot RV Campground in mid-afternoon and were directed to our site by the camp host. Although the site is a pull-through and plenty long enough, the property is terraced and it took some coaching from the camp host and the manager to get our rig positioned properly on the site. There were a lot of trees on the site which made us wonder if we would be able to get a signal from our DIRECTV satellite. We were happy when the satellite signal came on beautifully. We had a few issues when we tried to hook up to the campground’s cable TV. After a couple of days of not being able to get the cable to work, we asked at the office and were told we needed to turn off our booster. Although we’re still not sure why this causes a problem, we were able to get cable access as soon as we turned off our Winegard booster. The primary purpose of our stay in Poplar Bluff was that Phil had a contract audit job at Briggs & Stratton. The job ran from November 9–20 so we had a free week before and after his work. Fall had definitely set in and the daytime highs ranged from the mid-50s to the mid-60s, providing few opportunities to sit outside in our new lawn furniture. Jan was looking forward to warmer weather later this year. One of our first activities was to carve the pumpkins Jason had brought us back in Nashville. Unfortunately, we had sold our pumpkin carving knife in our estate sale (figuring that we would have no use for it in our new life) and we struggled to carve the pumpkins with our regular kitchen knives. No matter the struggle, we had fun carving them and then displayed them in our windows for the next two nights. Poplar Bluff is near the edge of the Mark Twain National Forest. This provided us some opportunities to do some hiking in the week before Phil went to work. On November 4th we went to Lake Wappapella State Park, had a picnic and hiked the Allison Cemetery trail. It didn’t take long to understand the derivation of the trail’s name as it led us to an old graveyard where most of the headstones held the name Allison. The headstones that were still legible were from the late 1800s. It was a good thing we had a trail map since the fallen leaves made it difficult to find any sign of a trail. It was clear that the trail had not been traveled much recently. There were trail markers on some of the trees but we totally lost sight of the trail at one point and, after much effort to find the next marker, we had to follow the road until we found the trail again. On November 6th we went to Markham Springs Recreation Area. We spent a lot of time traipsing around in the woods but had a hard time finding any of the hiking trails. We found a path along the river and followed it for a while before quitting for the day. Poplar Bluff is a relatively small town, with a population of about 17,000. Most of the businesses in town appear to be along Business 67. The local hospital is the largest employer and Briggs & Stratton is the second largest (with between 700-1,000 employees). We went to a local festival and treated ourselves to a couple of fried pies (sweet potato and pineapple), a local delicacy. One Saturday we drove to Cape Girardeau in search of a somewhat larger town (population 37,000). We both got our hair cut and took advantage of the larger selection of retailers such as Target and Sam’s Club. It probably didn’t warrant driving 83 miles each way but it was a nice day and we had time to kill. Although our DIRECTV package gives us 175 channels, we often find that there is nothing good to watch on TV. On those nights we play games or watch DVDs. One night we decided we should hook up our Wii. After some struggles with finding out how to hook up the Wii to our Sony AV Receiver, we had success and were able to play Mario Karts again. Unfortunately, when we disconnected the Wii, we found that we no longer had video from the satellite. We spent over an hour with a DIRECTV technician but couldn’t find the problem. There were so many pieces of hardware, along with wires and cables, in the cabinet above our TV that it was very hard to figure out what went where. It didn’t seem to be a DIRECTV issue since we still had satellite reception in the bedroom; however, we couldn’t find any loose connections. Jan’s perseverance finally paid off when she traced all the cables in the cabinet until she found the missing connection. Although frustrating, this experience taught us a lot about our various entertainment devises and how they are linked together. Our camp site was rather quiet. Although there were quite a few rigs with long-term campers up on the hill, we were parked in the shorter-term area. Given that it is November, most of the sites were empty or were occupied for only a day or two at a time. We did have a few rigs near us but there was little or no activity at them and, thus, no opportunity to socialize. Phil was startled one night when he was emptying the holding tanks in the dark and was suddenly surrounded by a pack of five kittens. After that night, we saw the kittens often and believed them to be strays. We fed them chopped-up hot dog and grilled steak one night and, needless to say, they wolfed it down. Having found someone willing to feed them, they proceeded to camp out on our steps until they realized there was no more food coming. The cats disappeared in the days after we fed them. We assumed they had been picked up by animal control. Then, about a week later, we saw two of them when Phil came out to grill some more steaks. Again, we gave them some chopped up steak and they chowed it down. The weather turned colder during the second half of the month. We had to disconnect the water lines on several nights when the temp dropped below freezing. We needed to drop our rig off at a DRV dealer in Jackson, MO for them to repair the crack in the fiberglass as well as a couple of other issues. Rather than stay in a hotel for a couple of nights, we decided to drive back to Nashville to spend Thanksgiving with two of our children. We spent Thanksgiving Day with Jan’s cousin and her extended family. The weather was unseasonably warm and we were able to play corn hole in the front yard. Unfortunately, the warm weather gave way to heavy rain. On the Friday after Thanksgiving, we drove back to Jackson, MO and picked up our rig, then drove back to Poplar Bluff for a few more days. We had our first experience with having to set up in the pouring rain. It was no fun! The rain continued for most of the weekend but fortunately slacked off when it was time to get ready to leave Poplar Bluff. However, it started up again as soon as we hit the road and it rained almost non-stop the entire four hour trip to Little Rock. We enjoyed our month-long stay in Poplar Bluff but were ready for some warmer weather. In order to attend the wedding of Phil’s niece on October 24th, we needed to find a campground near St. Louis, but not right in the city. Phil found the 370 Lakeside RV Park in St. Peter’s to fit the bill. It came highly recommended in the online reviews and was only about 40 minutes away from the wedding and rehearsal dinner venues. 370 Lakeside appears to be a fairly new city park on the edge of a decent-sized lake. There is about a 3-mile paved trail around the lake. Although there are no mature trees on the property, it was a nice, clean campground. There were canoes, kayaks and bicycles available for rent but the fees seemed rather pricey. By the time Phil booked the reservation, there were no pull-through sites available. However, he was offered a large back-in site that was considered a “premium” site since it was right next to the lake. We arrived mid-afternoon on Thursday and, after checking in at the office, proceeded to our site. Using the training from RV Driving School, Phil attempted to back into the site with Jan attempting to guide him in. One of our neighbors must have known it was show time as he came out of his rig and sat in his lawn chair to watch. At first, Phil thought he was going to have success but started to panic when he saw how close he was coming to hitting the tree and rig across from our site. Before long, we were joined by two of the neighbor men who provided advice as to how to get us backed into the site. After a number of back and forth attempts, we managed to get our rig backed into the site and right next to the hook-ups. All’s well that ends well! We spent a nice week in St. Peter’s. We attended the rehearsal dinner on Friday evening, the wedding on Saturday evening and a post-wedding brunch at Phil’s brother and sister-in-law’s house on Sunday morning. The weather was rather overcast for most of the week and extremely windy most days. We don’t know if the wind was the result of Hurricane Patricia that had hit the Pacific coast of Mexico but it was quite strong and lasted for days. We put down our outside rug but needed to weight it down with the pumpkins Jason had bought us to keep it from blowing away. The area around St. Peter’s turned out to be pretty nice and we visited a number of the stores during our stay to add to our collection of RV life necessities. Phil took the truck to the local Ram dealer to get a safety recall issue addressed and to get them to add air to the dual rear tires. Phil has still not found an easy answer for adding air to these tires and the Internet hasn’t been much help. For every suggestion, there is a response saying why that suggestion won’t work. The weather improved enough one day for us to walk the loop around the lake. We wished we had brought our bikes with us. We did stop to talk with a gentleman about the bike rack he had on his car and got some good advice from him. Phil assembled the Weber grill and grilled burgers one night despite the wind. We had intended to grill again on our final night but the wind was just too strong for that. 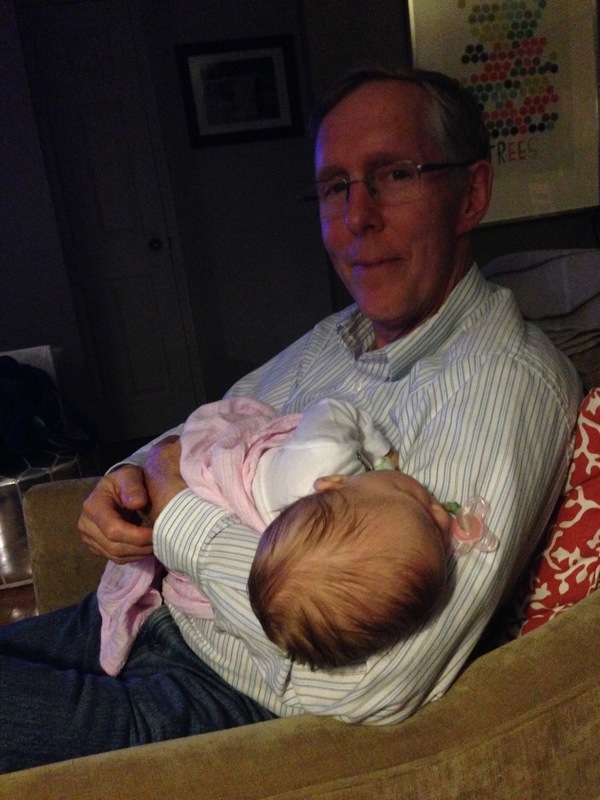 Instead, we visited with Cody and Liz and got to meet their new daughter, Claire. After our week-long stay in St. Peter’s we packed up on Thursday morning and headed off to Poplar Bluff. We stopped off in Jackson, MO at another DRV dealer to see about getting some warranty work on a small crack that Jan had discovered in the fiberglass. 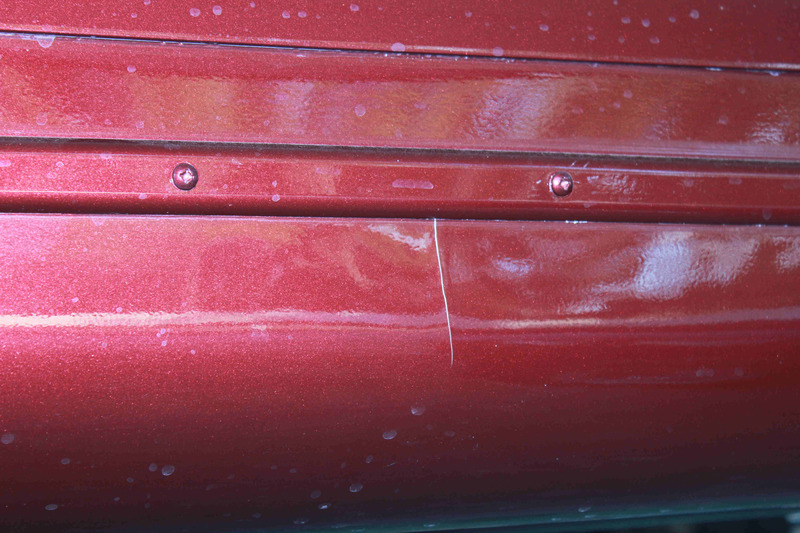 The service manager at the dealership examined the crack and will be filing a claim with DRV. We hope to get the crack repaired during our stay in MO. After our five-day stay at Yogi Bear’s Jellystone campground in Nashville, we headed out to explore America. We headed toward St. Louis where we were scheduled to attend Phil’s niece’s wedding on October 24th. Since we have agreed to limit our driving to four hours a day, Phil had booked us a 70 foot pull-through site at Ferne Clyffe state park near Marion, IL. We arrived at about 2:30 pm. We had expected to find a ranger station when we entered the park but, since we did not, we continued to drive into the campground. After a sharp bend, the road squeezed between two large trees. Phil held his breath as he managed to get the rig past the trees without any damage. The road then forked and Phil followed the sign toward sites 36-52. Since we had reserved site 37, we quickly found the sign for our site. However, instead of the long pull-through site we had reserved, site 37 appeared to be a back-in site and a short one to boot. In a quandary as to what to do, we circled around the campground until we found the camp host’s trailer. Phil approached the host and asked if we were in the right place since the site 37 we had just been to wasn’t a pull-through. The host assured Phil that site 37 was a pull-through and gave him directions that were the same way Phil had gone originally. After Phil circled through the campground a second time, with no more success than the first, the camp host came to help and directed Phil into the campsite. The camp host then explained that, for some crazy reason, the park put the post with the site number at the end of the pull-through rather than at the beginning of the site where we would have seen it when arriving. In addition, the site was so heavily covered in leaves that it was hard to see that there was a drive there. Anyway, once we found the site, it was easy to pull into and was quite level. After thanking the camp host, we unhitched the trailer and began hooking up. It was only at this point that we discovered that the site had no water hookup. We had known that there was no sewer hookup at the site but the lack of water came as a surprise, especially since we did see water hookups at some of the other sites. However, we hunted around the site for quite a while before concluding that there was no water. Phil even checked the state park’s website and, although it mentioned that site 37 had electric, it didn’t mention anything about water. The good news was that we had some water in our fresh water tank. The bad news was that we only had 17 gallons and, being newbies, had no idea how long this would last. The irony here was that the dealer had added 80 gallons to the fresh water tank to test the tank and we had neglected to drain the tank before driving to Nashville. Since water weighs about 8 lbs. per gallon, this added about 640 lbs.to the load we towed to Nashville. We had discovered this mistake during our stay in Nashville and had drained most of the water from our tank. Anyway, since we were only staying overnight, we figured we would just conserve water during our stay. This involved using the public restrooms and Jan bought some bottled water during our shopping trip to Wal-Mart. In the end, we didn’t need to have worried as much as we did. We left the next morning with 13 gallons still in our tank. Although we had driven less than 4 hours, we were both exhausted. After a quick trip to Marion, IL for grocery shopping, refueling the truck and dinner at Backyard Burgers, we went right to bed.